We’re excited to be putting on a series of free to attend events during April and May, targeting conveyancers across Britain’s coalfield. Each event will provide an opportunity to find out more about our new official CON29M report that launched on 5 April, 2019. 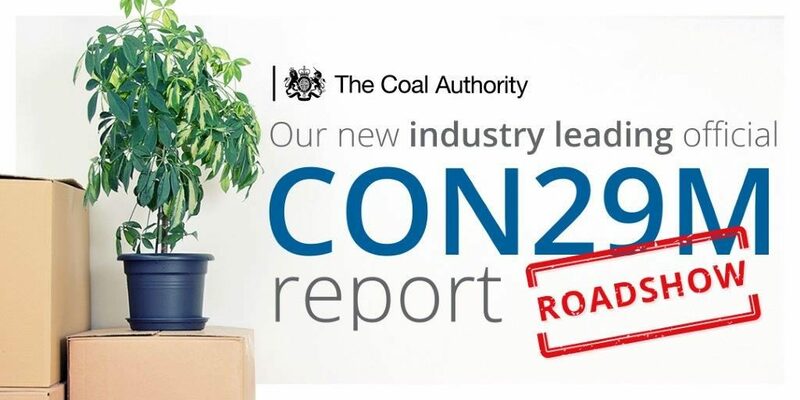 Members of the Coal Authority team will be on hand at each of our events, to guide you through our new report, as well as giving you the opportunity to discuss any questions you may have. In addition to providing further insight into our new official CON29M report, each event will feature a different guest speaker session. This will provide a unique opportunity to hear from industry experts and discuss key conveyancing related topics. Our industry leading report is a vital and trusted tool for use during the conveyancing process, providing accurate information and reassurance when purchasing a property or land on the coalfield. Our newly improved report highlights key information specific to a property, at a glance – enabling faster and better informed decisions. Spaces are limited, so please register now to avoid disappointment. Simply click on the relevant date below to book your place. John Logan, Country Manager for Scotland from Stewart Title will discuss Title Indemnity – Mines, Minerals and Miscellaneous Matters. Sandra Reid, President of the Scottish Paralegal Association. Karen McCormack, Property Searches Manager at United Utilities who will discuss the importance of the CON29DW. Leanne Wright, Stakeholder Engagement Manager for the Local Land Charges Programme at HM Land Registry will provide an update on HM Land Registry digital transformation towards becoming the world’s leading land registry for speed, simplicity and an open approach to data. Amy Parkinson and Cathryn Clayson, Customer Relationship Managers at SafeMove will take a detailed look at the official CON29DW report. They will use case study examples to explain the differences between the official search and the many regulated searches that are available. Leanne Wright, Stakeholder Engagement Manager for the Local Land Charges Programme at HM Land Registry will join us to provide an update on HM Land Registry digital transformation towards becoming the world’s leading land registry for speed, simplicity and an open approach to data. Wendy Harbottle, Head of Sales at Central Law Training will explain more about their introduction to residential conveyancing e-learning course. Owen Davies, Searches Business Development Manager at Severn Trent Services will discuss the official CON29DW. Martin Smith, Stakeholder Engagement Manager for the Local Land Charges Programme at HM Land Registry will join us to provide an update on HM Land Registry digital transformation towards becoming the world’s leading land registry for speed, simplicity and an open approach to data. Northumbrian Water’s Property Solutions Team will take us through the official data CON29DW report with an ask the experts session. Leanne Wright, Stakeholder Engagement Manager for the Local Land Charges Programme at HM Land Registry will also be joining us to provide an update on HM Land Registry digital transformation towards becoming the world’s leading land registry for speed, simplicity and an open approach to data. The event will give a unique opportunity to visit the Coal Authority’s mining heritage centre, where Helen Simpson, Records Manager and Coryn Reynolds, Records Officer, will host a tour of our archives, featuring original coal mine abandonment plans. Owen Davies, Searches Business Development Manager at Severn Trent Services will join us to explain the official CON29DW report. Punit Tejura, Service Transformation Manager for the Local Land Charges Programme at HM Land Registry will join us to provide an update on HM Land Registry digital transformation towards becoming the world’s leading land registry for speed, simplicity and an open approach to data. To find out more about our official CON29M report please click here.